UPDATE #2: It's official. 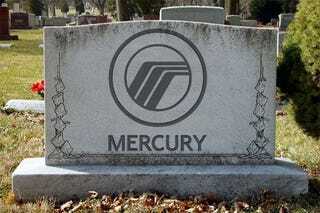 Ford's killed the 71-year-old Mercury brand. The last wing-footed car will roll off the assembly line in the 4th quarter of this year. UPDATE: We're told Ford will likely announce they're killing the 71-year-old Mercury brand at a 3:00 PM EST press conference today. We're told we're allowed to officially report on the news from the event at 4:00 PM EST. Close enough. Top Ford executives are preparing a proposal to eliminate the faltering and lost-in-the-woods Mercury brand, according to Bloomberg News. Sources say the brand, which is losing half of its offerings in 2010, will be wound down this year. Despite a 74% sales decline since 2000 and the axing of cars like the Sable and Tracer, Ford has continually suggested that new Mercurys were coming and that the brand, created in 1939 by Edsel Ford, wasn't dead. Mercury To Unveil Focus-Based Compact, What Should They Call it? When contacted by Jalopnik, Ford would only issue a non-denial denial. "What I can tell you is, our plans for Mercury have not changed," said Ford spokesperson Mark Truby. "We constantly assess our business portfolio like any good business would." Exactly what those plans are isn't clear, since all Mercury has announced is a Focus-based compact concept. Obviously, things just haven't been the same since they lost Jill Wagner. This story originally ran at 2010-05-27 3:00 PM EST.